Think big. Think tough. Think capable. Think versatile. Think about combining all those stalwart qualities into a king-of-the-road multi-tool that also features the ease and convenience of wrist-flick deployment. 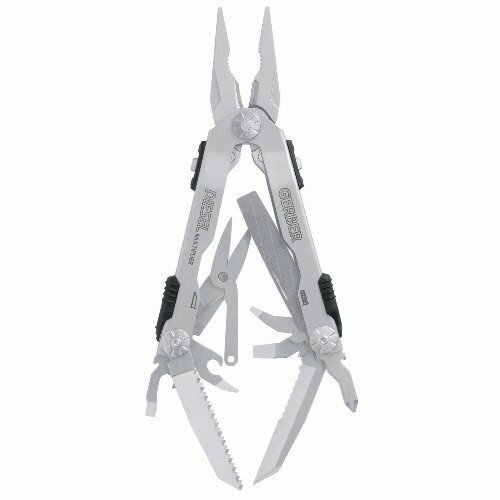 Thats the story behind the Diesel Multi-Plier.Were talking about an industrial-strength tool, here. The kind that pulls no punches and shrinks from no task...regardless of how tough it might be. The individual stainless steel tools are bigger than average, and more rugged than normal. And each one locks into place for maximum safety and security.Maybe you could get by with a lesser tool. But why run the risk of all the cussing and fuming when you can own the multi-tool that rules the road. Diesel. The one tool you need when you can only carry one tool. Components: Needlenose pliers, wire cutter, wire crimper, partially serrrated knife blade, cross point screwdriver, small, medium and large flat blade screwdrivers, can opener, bottle opener, file, saw and scissors.